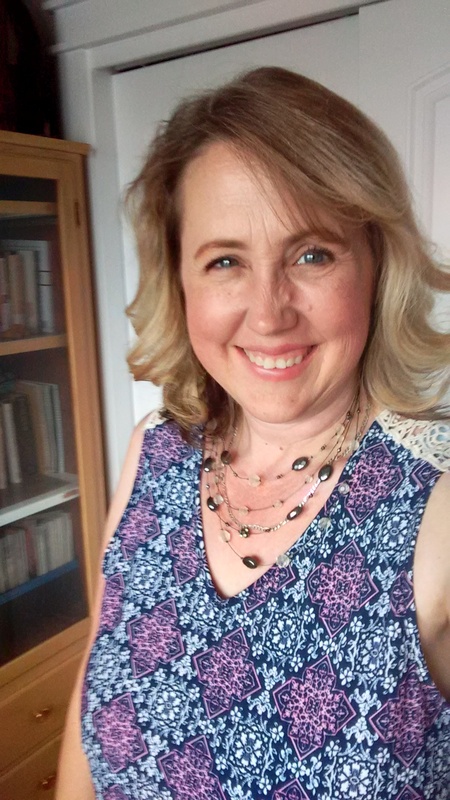 My latest Stitch Fix came at the perfect time– I had two graduations to attend and hadn’t done a bit of thinking about what to wear. Here are the things that they sent me. First up is this knit tank top in a fun pattern. It is nice and loose, with a pretty pattern, and has a lacy inset at the back. It feels like it will be a wonderful option for a warm summer day. I am a little less than fond of the lace in back where bra straps will show through. But this top has it only along the top 3 inches or so, so I think it will be OK.
Next is this necklace. 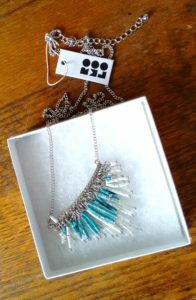 I think it is really pretty, but it was $28 and it is long and lands low, in an area I don’t really want to accentuate. So I think I will pass on this one. 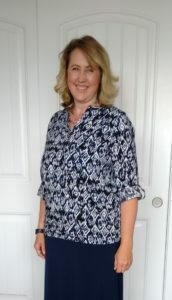 I thought that I liked this blue patterned blouse until I saw it in the picture. It fits nicely and felt flattering looking in the mirror. But in this photo and with this skirt I am afraid it looks downright frumpy. Maybe it would like nicer with a pair of slacks…? The other issue is that my last Stitch Fix also included a blue patterned blouse, and I don’t think this one is enough different to truly be adding something different to my wardrobe…. 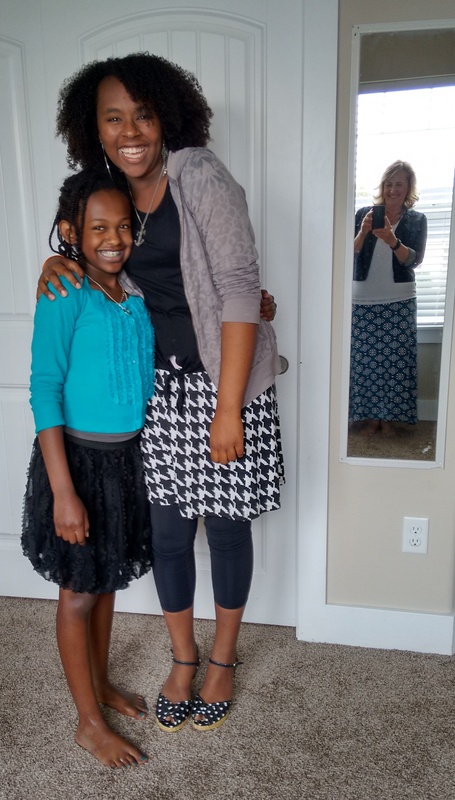 Then finally here are the biggest winners in the fix– first this maxi skirt. I am such a sucker for maxis as they are so so comfy and still manage to look nicely dressed up. Then second was the white top– just a simple t shirt knit, but with a neckline that falls in a flattering way. And it fills a niche as I don’t really have any white tops. Of course when I spilled something on the top 30 minutes after putting it on, I remembered why I don’t tend to buy white! But the spot scrubbed out, and I think the top will be useful with a variety of different outfits. Stitch Fix is a personal shopping service that picks clothing for you based on a questionnaire that you fill out. You can also share your Pinterest clothing board to give your stylist more ideas of what you like. You can order a fix as often or as infrequently as you like. Each fix consists of five items for which you pay a styling fee of $20. That $20 styling fee applies toward any item you keep. Keep what you want, and send whatever you don’t want back in the prepaid envelope that comes right along with your fix. Easy peasy. Click on my referral link to order a ‘fix’ of your own. For extra fun, when you sign up and refer someone else, you’ll get a credit that applies toward your NEXT fix. What fun! Fix-wise, I do like the maxi and I know those are faves of yours as well. For the blue patterned shirt you liked IRL but not in photos, have you tried it with a belt? I think that might be part of the problem, since it hangs a little low (how those of us over 25 generally prefer!) but is loose so you lose any shaping. I believe belts are coming back in style, too. The belt is a good idea. It did end up looking better with jeans. I think the loose skirt and the loose top together were just too much shapelessness. Your girls are sooooooo sweet! I can only wear patterned tops layered under a solid–have you tried layering the blouse you liked on but not in the photo? I love the maxi skirt outfit. So cute!